The appendix is an embryonic residual formation located adjacently to the so-called ileo-cecal valve (the junction of the small and large intestines). Its function remains unknown. However, the presence of lymph nodes has involved it in the body’s defense system. 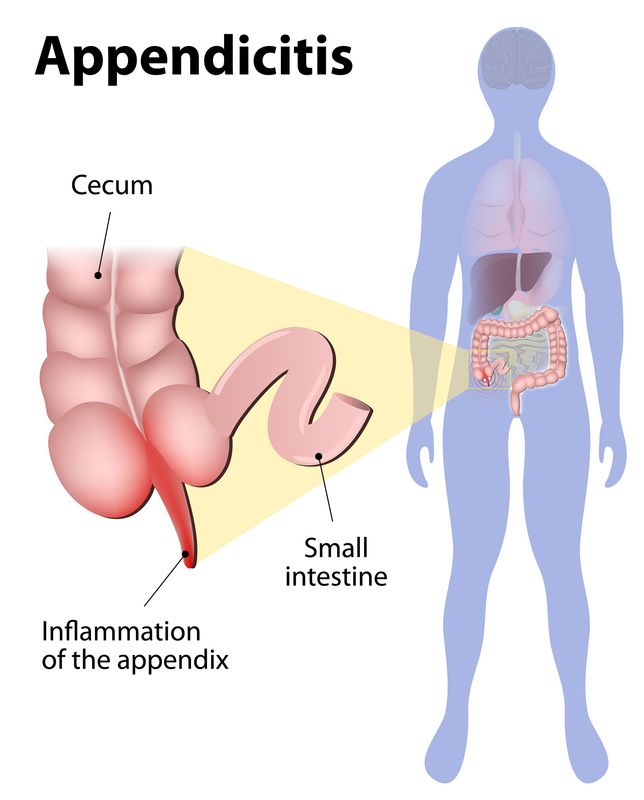 The blockage of the appendix lumen may result in its inflammation (acute appendicitis). Such an occlusion may be due to feceloma, fruits or vegetables, neoplasms, lymphoid tissue hypertrophy, parasites, etc. This inflammation results in wall edema or even its rupture, which causes local or generalized peritonitis, a life-threatening condition for the patient. The symptoms accompanying appendicitis include pain, anorexia, nausea, vomiting, alternation between constipation and diarrhea. Diagnosis is based on the clinical image, the abdominal ultrasonography and the general blood count (leukocytosis). Acute appendicitis is a condition requiring immediate surgical treatment. It constitutes the most frequent surgical condition of younger age. Traditionally, its treatment included open surgery with an incision made on the right iliac fossa (McBurney incision or its variants). Currently, the indicated method for treating acute appendicitis at clinics with well-experienced surgeons is laparoscopic appendicectomy, which combines all the advantages of laparoscopic surgery. This method includes the insertion of a camera via a small umbilical incision as well as special laparoscopic equipment within the abdomen via two small incisions (5mm in diameter) on the left lateral abdominal wall as well as in the suprapubic area. The intervention is completed in a very short time (approx. 30 minutes, depending on the findings) and is causes virtually no blood loss. The use of a camera facilitates the imaging of the remaining part of the abdomen for any other condition, allowing for the lavage of the entire abdomen in case of peritonitis as well as the imaging of internal genitalia. The laparoscopic method minimizes postoperative pain, requires shorter colon mobilization, faster recovery and return to daily activities and work. Hospital stay usually lasts one day.